3.1 How to Get Rid Of Pesky Carpenter Bees? 6.1 What Is Bee Relocation? 7.3 Can I use honey after bee removal? First of all, I want to appeal to those who often encounter the removal of bees, as well as to beekeepers. Very often, bee removal is urgently needed, and before the homeowners hurried, trying to remove the bees themselves and harm them, you can easily prevent it. In this situation, an excellent and safe solution is a bee vac. 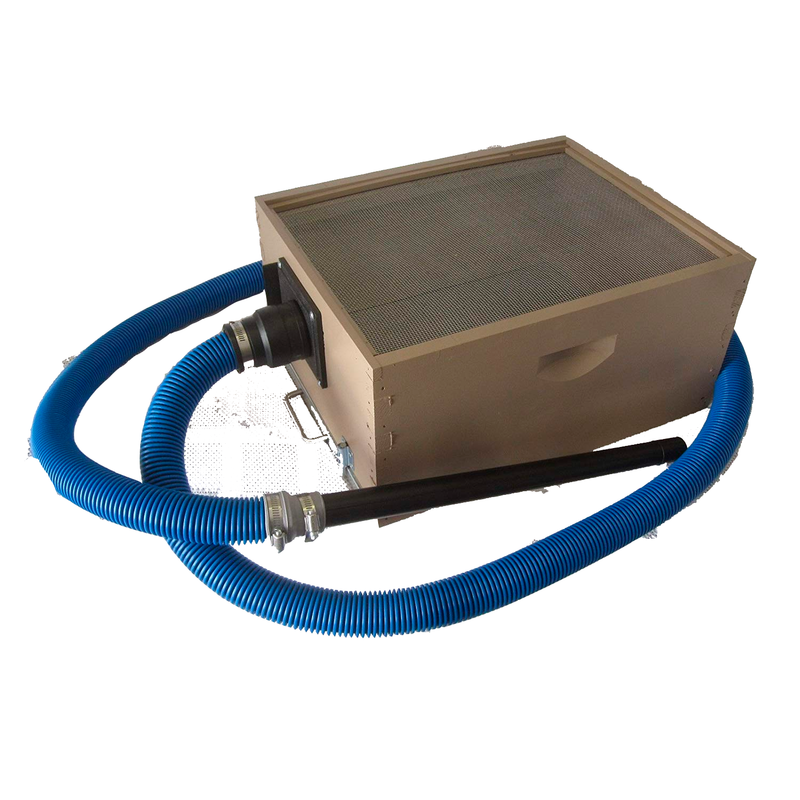 The suction power is adjustable, so you can adjust to the size of the bee nest. For all the time of use (in 2018, I’ve made about 80 bee rescues) zero bees were killed. I believe that its effectiveness in preserving bees is 100%. Besides, I was never stung, although I did not always manage to wear a complete bee suit. With bee vac help it is very convenient to remove bees from the walls and from round objects – barrels, pipes and so on. It’s quiet – so bees have no idea what is going on by the time they are already sucked out of the pipe and fixed inside the bee vacuum catch box! 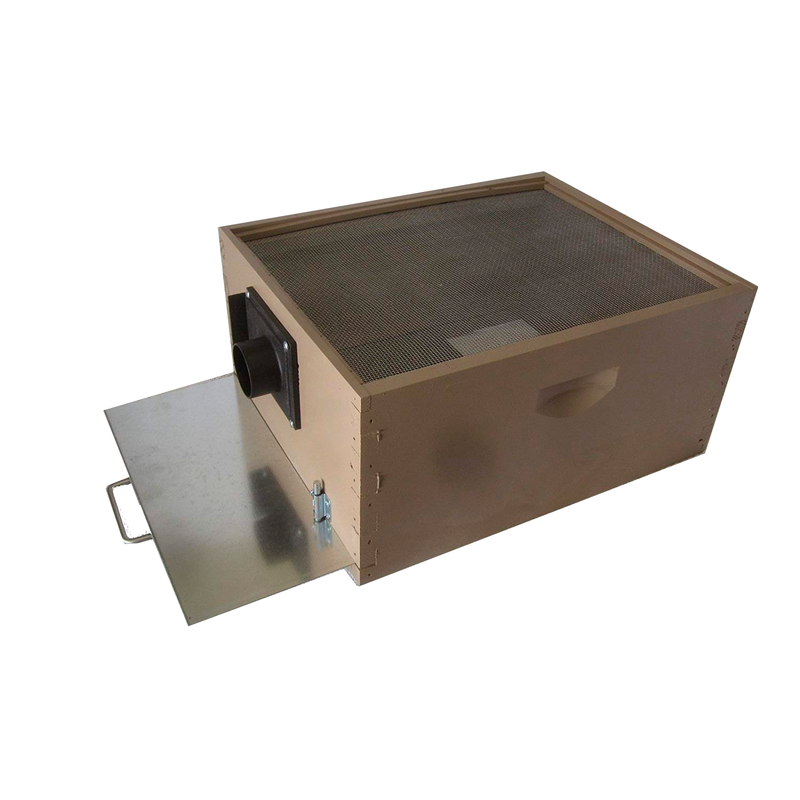 By the way, an option to set a bee catch box on the new brood box is a major asset – bees can move to their new home themselves, without being “dumped” into a new brood box. Only this year it has paid off many times. Poison or a pack of bees now costs more than $100-130. Catch 3 swarms for a couple of years (or even one season), and you’re in money and honey. Profit! Noticed a swarm and don’t know how to deal with it? Don’t harm it, trying to remove yourself! Bees can be collected by professional beekeepers and relocated. One of the team, who can do it, is SwarmPatrol, “Report a Swarm” page. Many people who have an infestation in or around their homes need to know what is bee removal, what damage can come from bees and why get bee removal. 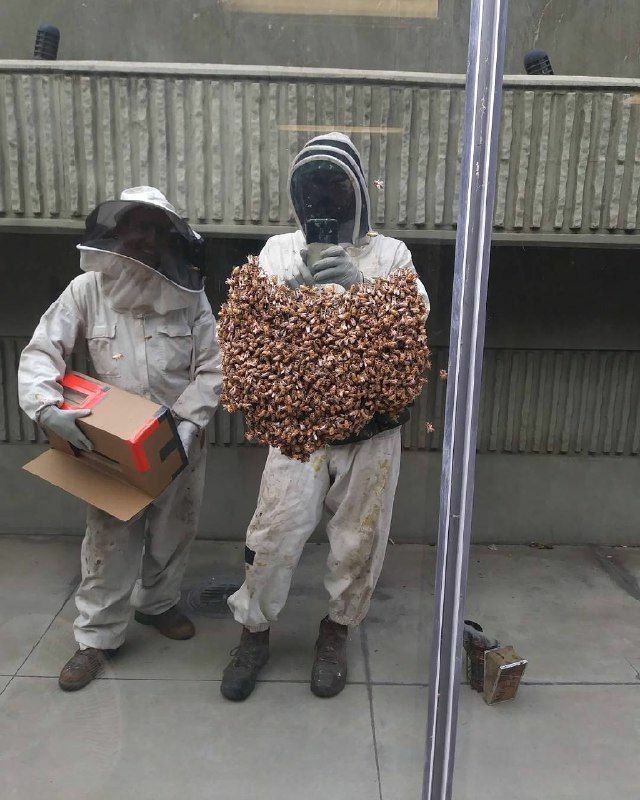 Bee removal can be quite a difficult challenge depending on the severity of the colonization and a host of other factors such as whether they are residing inside a building or outside. Proper identification of the bee species is also a contributing dynamic to ascertaining what method of bee removal is most beneficial both to the colony and the person needing to get rid of them. The majority of the general public decides to exhaust all other options before exterminating them as a result of the honeybee die-off phenomenon known as colony collapse disorder. According to the American Beekeeping Federation, one of the reasons bees are so important to human beings is because one-third of the total amount of food consumed in the United States has initially originated from honeybee pollination. As a matter of fact, over eighty percent of fruits and vegetables are a result of pollination. That being said, any effort made to preserve the nest benefits greatly the planet. On the other hand, bees can quickly multiply and a single colony can grow as much as 50,000 bees before dividing and relocating to a nearby location. This can be intimidating and scary, especially when children and pets are around. Most experts assert that the best option is to consult both a beekeeper and an exterminator who specializes in bee removal. All circumstances are different, so what may be right for one case may not be the most feasible for another. If after all efforts of live removal have been exhausted, calling an exterminator may be the next course of action to confront the problem head-on because they can cause considerable damage. 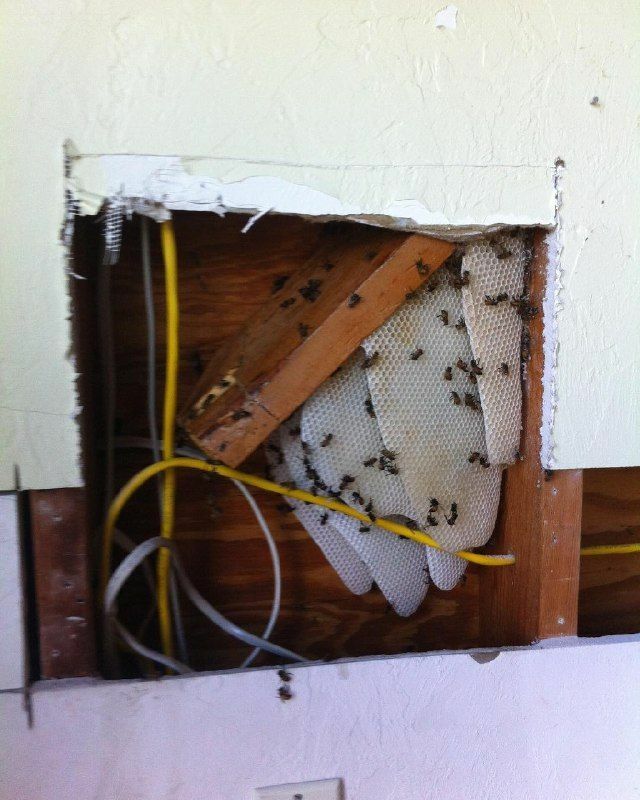 You may be asking what damage can come from bees and why get bee removal services? The larger a bee colony gets, the more weight is amassed and this can degrade the home’s structures such as walls or roofs. Also, depending on the elements, the wax from the honeycomb can begin to melt in hot climates which permeate through the walls. Due to the oily components of the wax, this can often leave hard to remove stains. Many animals with a good olfactory ability can easily locate bee hives and during the attempt to get the honeycomb can cause severe damage to a home. Raccoons and insects are notorious for this very thing! 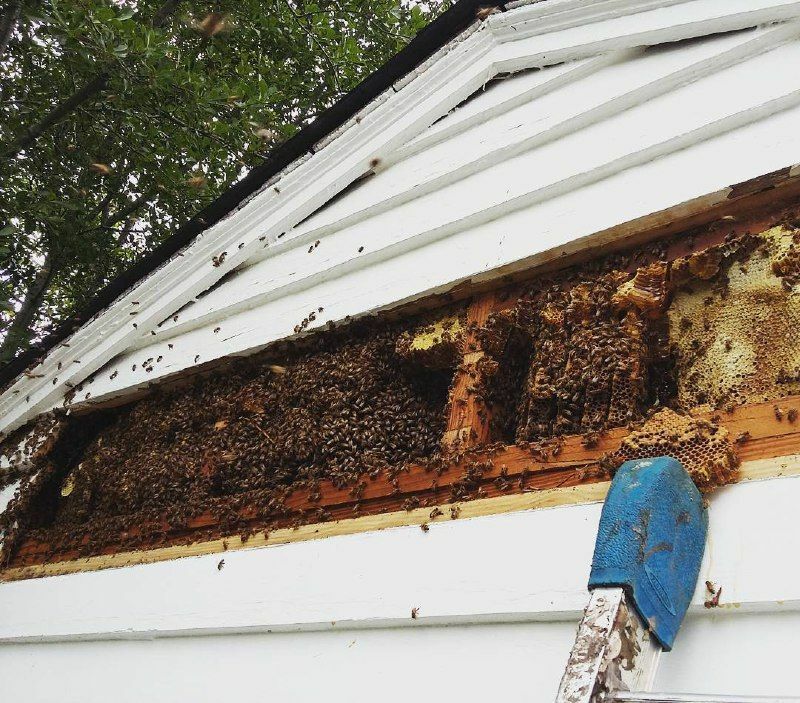 There have been some instances where bee colonies had resided in a home’s walls for many years and the honey filled the cavities from to bottom creating pressure and expansion to the point of rupture. Local bee keepers often offer their services for free in exchange for the colony itself or the honey found therein. The beekeeper will usually remove the honeycomb with the bees still in place and transfer them into a sealed structure-like framework, which then can be added to their own hive. When assessing the situation they factor in how difficult it will be and the location of the hive. If this method is not attainable using a vacuum is most likely the next step. Protected using a special bee suit and mask, the bee keeper will use a smoker to settle down any turbulence before vacuuming them out. Live bee removal is very time consuming and can take up to eight hours in severe circumstances. After the honeycomb with bees is relocated to the frame, it will take some time for any remaining bees to migrate back to their nest. If the queen is already in the hive it should be a relatively shorter time. If not, the beekeeper has to find the queen and this is why can take so long. If an exterminator is called for removal they will kill the colony using some form of a pesticide in most circumstances. He or she will have to return for the next few days because the initial spraying will only kill off the bees on the surface of the comb or nest. The pupa that is deep within the nest will start to emerge days later and he will repeat this process until they are all exterminated. After this has occurred, the nest must be disposed of with precautions because of the hazardous chemicals on it. If the exterminator will not do it, then the burden is on the homeowner to do so. If the bees are carpenter bees and the hive isn’t so big, a carpenter trap may work. As one can see, there are many bee removal options to consider and each case will be determined according to the aforementioned methods and circumstances. After all, what is bee removal efforts for if they aren’t fully effective. How to Get Rid Of Pesky Carpenter Bees? If carpenter bees are becoming a nuisance, there are always plenty of local bee removal companies available to handle the problem. So how to find local companies? There are plenty of good sources. It is also helpful to ask a friend or neighbor in the neighborhood since they are likely to have the same problem. The internet, newspaper, and phone book are also good places to look and often offer reviews. It is important to get rid of carpenter bees as quickly as possible because they are pests. They will drill holes in dead wood, and that includes your deck, shed, or even home. The dog house isn’t even safe. It is necessary to get rid of them, or they will cause some expensive and unsightly problems. Unfortunately, trying to handle the problem on your own isn’t always effective, and it is pretty much inevitable that a call to the local bee removal companies will be necessary. They make any bee problem go away-whether they are hanging around the business or home. All you have to do is call them up, and they will handle it. They have the equipment and enough pesticides to handle any bee problem-big or small. Many people try to take care of the problem themselves with a can of bug spray, but it is normally more effective to have the experts scour the area and take care of the problem at the source. Another reason to call in the professionals is to avoid having to deal with a bunch of chemicals that aren’t great to be breathing in. They are not only equipped with pesticides but the protective gear as well. They will spray the pesticides, use the foggers, and also clean up the dead bugs, so it is definitely worth having them do it. If you are outside enjoying a nice day and notice some strange looking bees hovering around a wooden fence or wooden siding or a barn you may be noticing carpenter bees. What are carpenter bees? These are bees that actually burrow holes into wood. They are somewhat of a nuisance since they can be highly destructive and actually cause structural problems to buildings if they are left alone. Some key things to look for to help you determine whether they are in fact carpenter bees are the following visual signs. First, you will notice deposits of bee excrement and pollen under or near the entrance hole they have burrowed. Second, there will be accumulations of sawdust from the holes and excavations they have created. Third, you may notice an increasing amount of woodpeckers near your property. Woodpeckers feast on young carpenter bees and will try to peck away at the structure that is housing them. There are several ways to remove carpenter bees. One process to remove carpenter bees is to simply leave it to the professionals. Many pest control companies can handle the removal of carpenter bees. These are non-aggressive bees that typically do not sting. 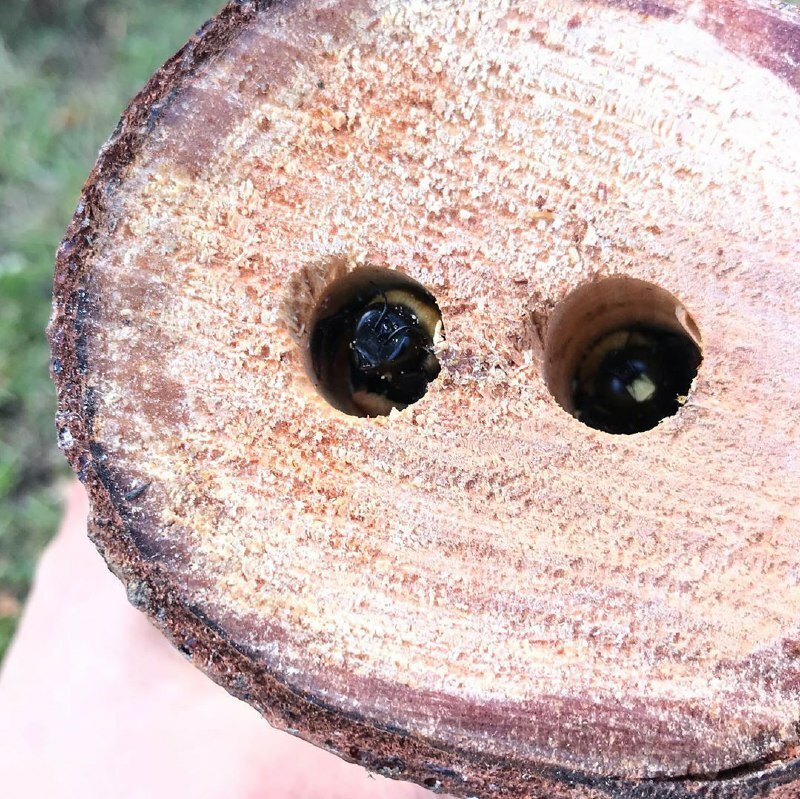 They do like to protect their homes and male carpenter bees will often be seen hovering near the entrance hole but it is simply to ward off other insects. If you feel as though you would rather remove the carpenter bees yourself then you have a few options. The first step would be to spray a residual insecticide in the opening of the hole they are burrowing in. Secondly, you can apply residual insecticide dust into the holes that have been borrowed. Third, you need to make sure that you plug all of the holes up in the fall to prevent them from returning in the spring and summer. While carpenter bees can be destructive and obnoxious they are still nature’s pollinators and help service agriculture. If you find yourself with a bee infestation on your property or in your home, you should know there is a professional way to remove bees. There are many opinions on how to remove a bee colony, but if you don’t have experience with these flying insects, you should leave it to the professionals. Whether they are close to your property, on your property, or even in your dwelling, this is a difficult situation to work with. Caution is a must. So what do you do to remove bees from a home or property? There are several options. You can locate a local bee keeper and see if they are interested in transferring the bees to another location for you. You can call pest control or an exterminator. Some people even leave the bees alone if there are no safety concerns. Whatever the choice, know there are professionals who can do the job effectively and safely. This is definitely not a job you want to try by watching a youtube video. So, first, you must decide if the bees should be removed. If that is the case, then how do you want to do this. Many people feel strongly about a humane way of relocating the earth’s great pollinators. If you fit into this category, you can do one of several things. If you can find a local bee keeper who is willing to help move the bees, great! If you need to contact a professional agency, you will need to find a company that relocates not exterminates. If you just want them gone, you can always speed up the process and call your local pest control and have the hive removed and killed. After the hive is removed how to prevent bees from returning will be determined by the agency that removed the hive. Removing the cracks in walls, filling spaces where the bees lived, even the use of citronella, cucumber peels, and sugar water are just a few ways professionals and homeowners keep bees from returning. Bee relocation is as simple as moving a hive from one location to another. So, what does bee relocation mean? They are being transported from one area to the next in an effort, to protect the hive. Professional relocation involves a highly qualified and trained technician pest control specialist. He or she can also hire an exclusive bee relocation expert. Those interested in bee relocation must be aware that eradication services will destroy the hive. Relocation will help their colony to continue to pollinate which also helps the production of many useful foods. Bee location is preferred by eco-friendly experts because it is a natural source for pollination for farms, plants, the environment, and other global crops. How does bee relocation help? Their services help protect the environment, and often times, rids your office, home, or commercial business of the unwanted pest. An individual hive can contract up to 50,000+ bees at one time, and can be dangerous to live or work around. 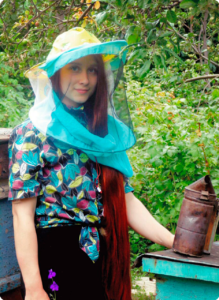 Small children and pets are subjected to the greatest threat of a hive of bees. More homeowners who are noticing an increased presence of bees around their home, and locate a hive; choose to relocate them as an eco-friendly act. Business owners have also can benefit from bee relocation with an outdoor eatery. According to research studies, an estimated 42% off all honeybees have died in the United States, and this is how bee relocation help by preserving the bees. Honey bees and bumble bees can be pesky little critters, but play a major role in the environment, and can benefit from relocation. He or she can hire trained professional to relocate bees in a quality and safe manner. Varroa mites on the honeybee’s back. Notice how small it is? Wasp nests can be a serious problem for those with children or who are allergic. The best bet is to call a professional exterminator. If this is not an option there are several things you can do yourself. Contact your local vector control district. This service is not available everywhere, it is worth a check. If they handle wasps, they may remove them for you free of charge. Do an internet search of “vector control” to see if this is available in your area. If this service is not available here are steps to solve the problem on your own. They differ from pollinating bees. Bees are full-bodied, hairy creatures and wasps are more slim bodied and appear to be hairless. Find out what type of wasp you have, whether it be paper wasps (they build large, exposed nests), yellow jackets (papery nest, often in the ground) or hornets (paper nest in tree trunks and wall cavities). The wasp removal process includes making sure to wear protective clothing, (coverage of your entire body). Approach the nest at night when wasps are less active. 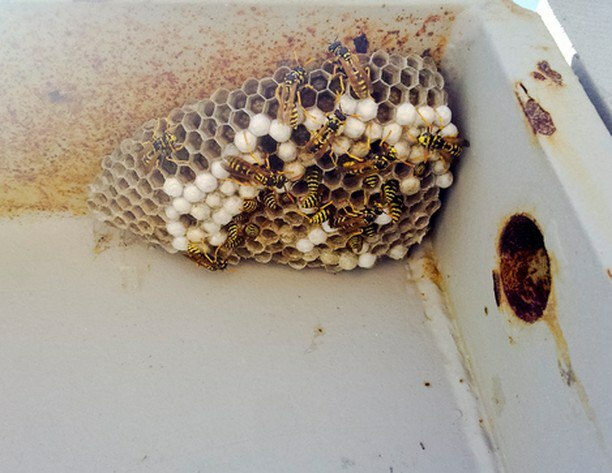 Thoroughly soak the nest with a pesticide spray for your specific type of wasp. If pesticides are not an option, use dish soap. Use 1/4 cup dish soap with a liter of water. It is important to remove this wasp nest as early in the season as possible, they multiply late in summer. To prevent wasps from returning, in the winter do an inspection of the outside of your home. Look for areas a wasp may get in. Caulk areas around windows and door frames and secure loose boards. Wasps will build a new nest near an old nest if it is not removed. Clean wasp nest areas thoroughly for prevention. Can I use honey after bee removal? Health Department says no to bottling or selling removal honey. Giving it to a customer out of their wall is a bit of a gray area, but I definitely do not advocate it.